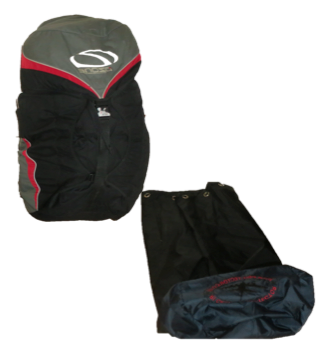 Q ~ How do I ensure that I order the correct size Rucksack Pro-Tector to suit my Rucksack? A ~ The Only way to be 100% sure that you are ordering the correct size Rucksack Pro-Tector to suit your rucksack is to pack your rucksack with pillows / cushions or the like and measure it and then compare the measurements with the sizes that I have promulgated on my site. Rucksacks really vary in their design, some are tall and thin whilst others are short and fat, Some people then strap Extra items on the outside of their Rucksacks, So my sizes, although Generous are for general guidance. Q ~ My Rucksack is considerably shorter than the nearest sized Rucksack Pro-Tector that fits the circumference, How can this best be secured? A ~ As per illustrations below, On arrival at the airport, put your Rucksack inside the Rucksack Pro-Tector and pull up the draw-cord to leave an equal length on each side. Thread the two visible lengths of draw-cord trough the handle so that the left goes to the right and the right goes to the left and secure around the handle with a bowknot. Q ~ Are Rucksack Pro-Tectors Waterproof? 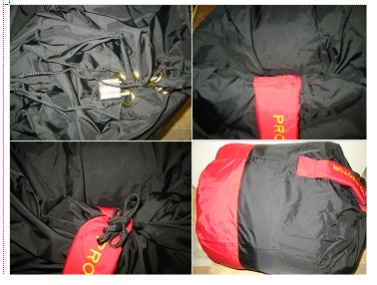 A ~ Although Rucksack Pro-Tectors are manufactured using strong waterproof material; I do not sell them as waterproof. 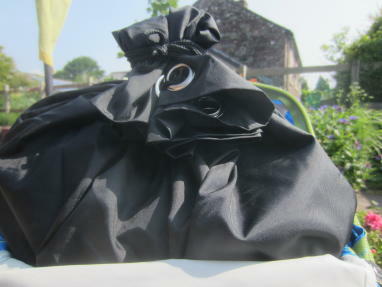 I do sell them as water-resistant, What I mean by this is that under normal circumstances, as long as the Rucksack Pro-Tector is securely closed, things inside will stay dry, but if. you immersed it in water then it would leak ! Although the seams are taped from the inside water will eventually migrate in trough the stitching holes. Having said that, I have used my own Rucksack Pro-Tector in its secondary function, as a water resistant liner inside my rucksack on many occasions whilst trekking in UK, Nepal and Spain (One of my treks in Spain was 1,000K alone) and everything inside has always remained bone dry. 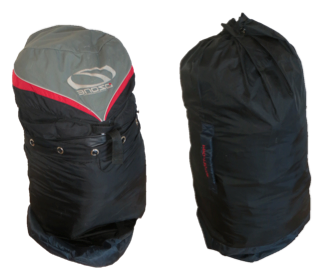 Q ~ Are Rucksack Pro-Tectors available anywhere else other than on the Internet? A ~ No, I am Sorry to say that Pro-Tector is entirely web based, The main reason for this is that to sell through an outlet would mean that the prices that would have to be charged are just not viable, as outdoor shops usually buy there stock in wholesale and then double the price for retail, because I am only a small manufacturer and have my products made in Nepal and therefore have to have everything air-freighted back to UK this is not possible. Q ~ Is the Rucksack Pro-Tector lockable? A ~ Yes ~ The Best way to lock your Rucksack Pro-Tector is by using a long stapled padlock which you will find at any good ironmonger or locksmiths. If you Really fill your pro-tector then another method is to use a cycle lock which you will find available from any good cycle shop. Q ~ Is the Rucksack Pro-Tector fitted with zips? A ~ No the Rucksack Pro-Tector does not have zips, This is a deliberate design feature as I strongly believe that zips are a weak point. 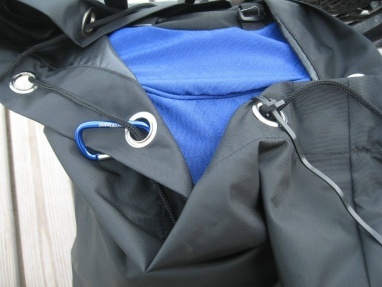 However The Rucksack Pro-tector does have a row of eyelets around the top, These eyelets take a draw cord and were also specifically designed to take a padlock. Q ~ Does The Rucksack Pro-Tector have a shoulder strap? A ~ No ~ The Rucksack Pro-Tector does not have a shoulder strap, It was designed with the intention that the user takes their rucksack to the airport on their back (Which is a far better carrying system than a shoulder strap) then when it is time to check in they simply pop their rucksack into The Rucksack Pro-Tector, this Usually enabling them to check it in as normal luggage and not at the Limited Liabilities desk, This saving time as well as helping ensure that your rucksack gets to its destination Safe, Dry and In One Piece. When your Rucksack Pro-Tector is compressed inside the pouch it will measure approximately 260mm (10 inches) in length by 300mm (12 inches) in circumference. Q – How do I use the Rucksack Pro-Tector in its second function as a water resistant liner for my rucksack. A – Once your rucksack has safely reached its destination, if you then wish to use it as a water resistant liner, you simply put it inside your rucksack, pack all your kit inside, tighten the draw-cord and wrap it around the Rucksack Pro-Tector, then double it over and wrap the excess cord around again tying it in a simple slip knot before securing your Rucksack. This will now help ensure that your kit remains dry inside your rucksack if you are trekking in wet weather. 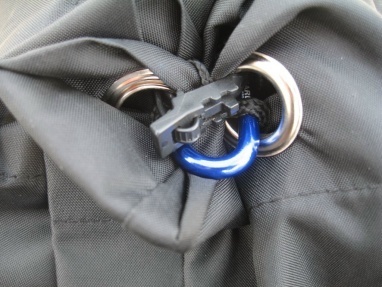 Alternative suggestion for securing Rucksack Pro-Tector’s using reusable cable-ties. Alternative suggestion for securing Rucksack Pro-Tector’s using a Carabina. Illustrating how to use the Rucksack Pro-Tector in its secondary function as a water resistant liner onside your rucksack. Q ~ Why do you not make the Pro-Tector Wallet a little smaller? A ~ The reason that the Pro-Tector Wallet is this size is that it will comfortably hold a standard (E.U.) passport. This is a deliberate design feature. Do things kept inside The Pro-Tector Travel Pouch remain dry or does perspiration migrate through. A ~ Although Pro-Tector Travel Pouches are manufactured using strong waterproof material; I do not sell them as waterproof. i.e. the zips are not waterproof. However perspiration rarely migrates through into the inside of the pouch because it has a double layer at the rear, which also forms an additional outside pocket. Also the Pro-Tector Travel Pouch is Designed specifically to be either worn over or under your clothing, Its flat construction means that you can comfortably sleep whilst wearing it (when you are staying in dormitory accommodation) and as it is flat it hardly shows under your clothing. OR If you prefer you can wear it above your clothing and All your travel essentials are easily to hand. The Strong webbing waist-band will take a camera pouch, this enabling you to keep your hands free. I tend to wear my own above my clothes in the daytime as I have a digital camera hung on one side and a 35mm compact hung on the other side, then in the evening I wear it next to my skin, so all my valuables are out of site and hopefully out of any rouges mind !! Q ~ I am in heading off on my trip soon and need my Rucksack Pro-Tector(s) in a hurry, How long does it take between sending in an order and you dispatching it. A ~ I usually dispatch orders on the same day as I receive them as long as I receive the order before mid-day on a weekday, I also usually dispatch on Saturday mornings. Please read my testimonials page where the speed of delivery is often commented on. Q ~ If I order the wrong size Rucksack Pro-Tector can I exchange it for a different sized one? A ~ Yes, What I usually suggest here is that you return your original order to us and as soon as I receive it (In original condition) I will dispatch you your replacement. The only thing I request is the cost of the postage.